Well, it’s that time of year yet again — it seems like only a few weeks since last Christmas! We’ve been rather rubbish at sending Christmas cards this year, but have at least managed to take a quick festive family photo before we head back to the U.K. for the Christmas and New Year’s festivities. 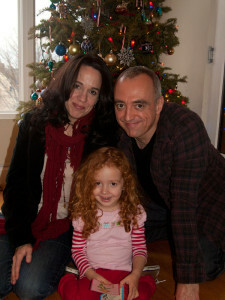 Merry Christmas and a Happy New Year from Tony, Lori Ann and Vivienne! Wishing you and yours a very merry Christmas and a fabulous 2014! This entry was posted in Family, Friends, Home, My Life on 22 December 2013 by Tony. There’s a bitter-sweet sensation that I’ve encountered periodically throughout my life when I discover that an idea I’ve had in the past for a product or service has become reality — but that someone else has made it a reality. I’m sure many other people have experienced this same feeling. It happened again this week when I discovered the existence of a New York-based start-up called Tagasauris.com. These folks have created a service that leverages Amazon’s Mechanical Turk service (a “micro outsourcing” service which matches businesses that need “Human Intelligence Tasks” completed with a network of digital “piece workers”) to address a challenge that I’ve been involved with for many years — adding metadata to digital images to make them more discoverable. It will be interesting to see what the quality of the tagging is like, since Tagasauris is using non-professional cataloguers, whereas I’ve always worked with qualified librarians that have a deep understanding of cataloguing rules, classification schemes and controlled vocabularies. Tagasauris claims to have a sophisticated quality assurance engine to maintain a high quality of tagging. It will also be interesting to see if they can make the service financially sustainable once the start-up funding runs out, of course! I will be keeping an eye on them to see if “my” idea turns out to be a good one. This entry was posted in Information Science, Internet, Museums, Libraries & Archives, My Life, Science and Technology, Technology, Work on 24 February 2013 by Tony. I’m resurrecting an old tradition this year by sending electronic holiday/Christmas greetings to friends, family, acquaintances, and the Interwebs at large. Merry Christmas, if you celebrate it, and best wishes for 2013 from all of us here in Brooklyn, NY! This entry was posted in Family, Friends, Home, My Life on 20 December 2012 by Tony. After a few months’ of messing around with WordPress in my (increasingly limited) spare time, I finally decided to pull the trigger today and go live with what has, until now, been the development website. What do you think? This new site replaces my previous hand-coded personal website that I was surprised to discover has been online pretty much continuously on various web hosts for the last sixteen years! This entry was posted in Internet, My Life on 19 August 2012 by Tony. 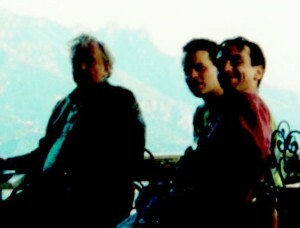 I was saddened to hear that Gore Vidal passed away earlier this week at the age of 86. 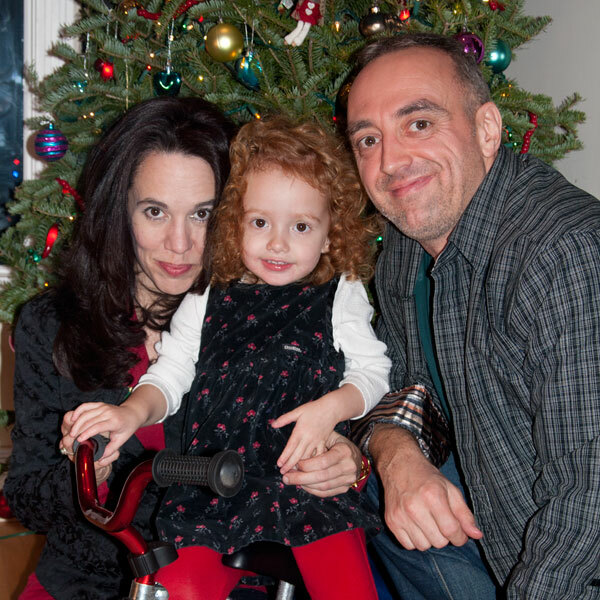 There’s a nice obituary by Hillel Italie over at HuffPo. 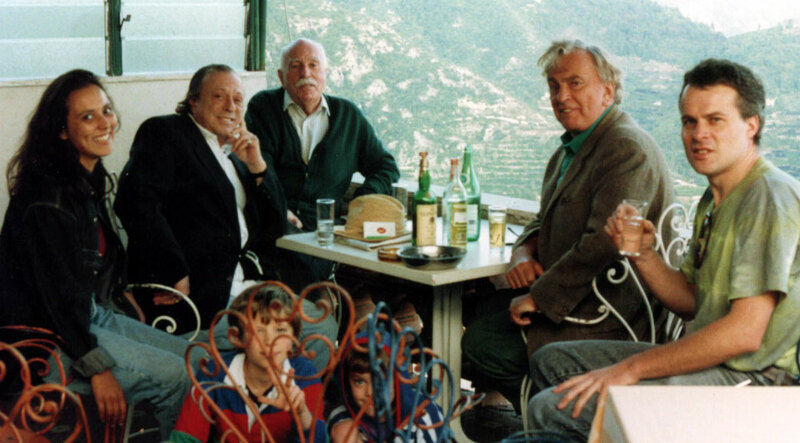 I spent a pleasant afternoon drinking vodka with Gore Vidal and friends (both his and mine) at a restaurant in Ravello high above Italy’s Amalfi Cost back in 1993. I was doing a placement at the nearby University of Salerno as part of my Master’s degree in Communication in Computing, and was staying in Vietri sur Mare a little further down the Amalfi Coast with Katie, my girlfriend of the time. My friend and fellow MA CiC classmate George Woodcock — a big fan of Vidal’s — was visiting with his two young sons for a few days, and, after recognizing Vidal, introduced himself to pay his compliments. 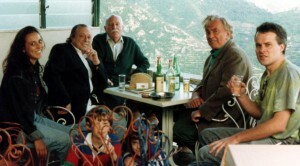 Vidal and his party were most hospitable, and invited us all to join them for some postprandial refreshments. I wasn’t at all familiar with Vidal’s literary work at that point (and in fact had always struggled not to confuse him with Vidal Sassoon, the British hair stylist who coincidentally also died recently in Los Angeles), but he was most charming and entertaining despite my ignorance, and showed a warm and seemingly genuine interest in our academic pursuits. I have since read and enjoyed a number of his books, both fiction and non-fiction. His “Narratives of Empire” series of historical novels are an excellent way for an immigrant such as myself to become more familiar with American history, while his essays on American imperialism are damning indictments that are still highly pertinent today. This entry was posted in Arts & Culture, Current Affairs, Literature, My Life, Politics, Raves, Travel and tagged Gore Vidal on 02 August 2012 by Tony. Blog Migration II: Independence Day 2012! After more than 2 years of complete blogging inactivity that corresponds almost exactly (and not coincidentally) with the lifespan of my 2-year old daughter Vivienne, I’ve migrated my blog once again — this time to a WordPress site on a new hosting provider that will eventually take over from both my blog and my personal website. Hello, World! Happy Independence Day! This entry was posted in Uncategorized on 04 July 2012 by Tony. Blogger (now owned by Google) recently stopped supporting externally-hosted blogs published by FTP, so I have been forced to migrate my blog hosting to Blogger’s servers. The migration doesn’t seem to have been completely smooth (specifically local image links, including the website navigation buttons, are broken), so please bear with me as I attempt to fix the glitches. This entry was posted in Uncategorized on 29 June 2010 by Tony. Don’t Buy ACDSee Photo Manager Software! My first blog post in some time is a public recommendation that you DO NOT buy any image management software from ACDSee, such as ACDSee Photo Manager or ACDSee Pro Photo Manager. I have been a user of ACDSee Photo Manager for some years, and have invested a substantial amount of time and effort in creating a comprehensive hierarchy of categories (a.k.a. metadata) with which to catalogue my extensive library of digital images. Last summer, I was attracted by a new feature in ACDSee Pro Photo Manager 2.5 — the ability to embed my laboriously-created metadata into my image files using Adobe’s XMP (Extensible Metadata Platform) technology. This would mean that my metadata was no longer held hostage in ACDSee’s proprietary database, and would also provide a useful backup in the event that the database ever became corrupted. So, I ponied up $77 for the software, taking advantage of a special promotion for existing customers. After installing the software, I ran the procedure to embed XMP metadata into all of my image files (the vast majority of which are JPEG files from Canon PowerShot cameras). However, after it completed, there was no evidence that any metadata had, in fact, been embedded into the image files. 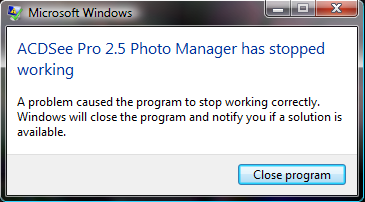 I even took files to work and viewed the XMP metadata through the Adobe Photoshop File Info Advanced tab, and was still unable to find any evidence that the categories had been embedded. Although frustrated by this apparent failure, I was too busy to do anything about it. Disabling Internet and anti-virus software. Eventually, after running out of alternatives, the tech support suggested that I download a trial version of ACDSee Pro 3.0 Photo Manager, to see if that would resolve the problem. And it did — it loaded fine, and successfully imported my Pro 2.5 database. Unfortunately, however, it’s limited to a 30-day trial — which I am now 19 days through. At this point, I was told that my only option was to pay another $89 to upgrade. They refused on all counts — hence this blog post. Anyone up for a class action suit? This entry was posted in Uncategorized on 07 February 2010 by Tony. I just saw whacky-but-allegedly-seminal author, philosopher and thinker Howard Bloom wandering around on Union Street in Park Slope, Brooklyn, while I was out for a run. 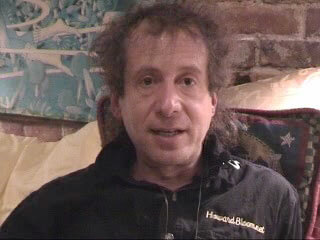 How did I know it was Howard Bloom? Firstly, I recognized him because he gave a presentation called “Notes from the Digital Desert — Saved by Cyber-Research” at the 2002 RLG Annual Meeting while I was working at RLG, and due to a crippling case of Chronic Fatigue Syndrome that rendered him unable to leave his Brooklyn apartment at the time, his presentation was delivered as a video recording for which I cleaned up the audio. But primarily I recognized him because he had “Howard Bloom” monogrammed onto his shirt, just as he does in this screen grab from his 2002 RLG video presentation! He looked somewhat distant, and was wandering around wearing an enormous pair of headphones. Still, it’s nice to see that he’s able to leave his apartment now! This entry was posted in Uncategorized on 11 July 2009 by Tony. This entry was posted in Uncategorized on 09 July 2009 by Tony.